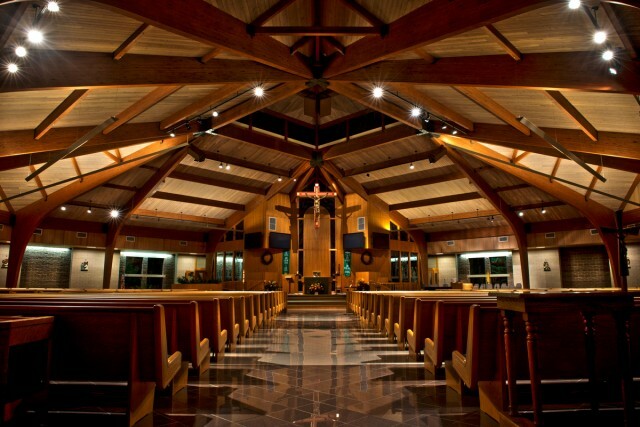 In 1982, the Township of Dover (Toms River Township) had two Catholic parishes: St. Joseph, that had served the community for over 100 years, and St. Justin Martyr, which was established in 1972. The Toms River area was growing so rapidly, that the Most Reverend John Reiss, Bishop of Trenton determined it necessary to establish a new parish to serve the faithful. St. Luke Parish was founded on October 1, 1982 with the Reverend Louis W. Kralovich as founding pastor. In the beginning, St. Luke Parish was truly a pilgrim parish, celebrating Mass in the local schools, firehouse and V.F.W. With Bishop Reiss’ approval, a capital campaign was undertaken to build a Parish Center and Rectory. The Parish Center/Rectory served as the worship space, administrative center, social center and education center of the parish from its’ dedication in 1985 until the construction of the current worship space. Construction of our beautiful worship space was undertaken in October, 1995. Designed by Martin DeSaapio, the Church was dedicated by the Most Reverend John M. Smith, Bishop of Trenton on October 18, 1997. St. Luke was the first parish Bishop Smith dedicated in the Diocese of Trenton. In April 2006, St. Luke was blessed with the arrival of Augustinian Fr. Robert S. Grodnicki. New to the Diocese of Trenton and the parish, Fr. Bob did not remain a stranger for long. With the retirement of founding pastor, Rev. Louis W. Kralovich in 2009, Bishop Smith named Fr. Bob Grodnicki (now incardinated into the Diocese) the Second Pastor of St. Luke. From his installation as Pastor in August 2009, Fr. Bob has shepherded this flock with compassion and understanding and continues to build upon the solid foundation established by Fr. Lou. Under Fr. Bob’s guidance, St. Luke has continued to grow in all ways possible-in membership, expanding minstries, as a social, charitable and healing center of the community. In November, 2011, St. Luke embarked upon “Lighting the Path”. This capital campaign, the third in the Parish’s history, was designed to address the faith formation, social outreach and administrative needs of a growing, vibrant parish. When completed, our Parish will not only meet current ‘space’ needs but will also be rededicating our current Parish Center as the “Rev. Louis Kralovich Center”, to honor our founding Pastor.